Nikolaus Otto was born in Holzhausen, Germany on 10th June 1832. In his early years he began experimenting with gas engines and completed his first atmospheric engine in 1867. In 1872 he joined with Gottlieb Daimler and Wilhelm Maybach and in 1876 developed the first 4-stroke cycle internal combustion engine based on principles patented in 1862 by Alphonse Beau de Rochas. Although Otto's patent claim for the 'Otto Cycle' was invalidated in 1886, his engineering work led to the first practical use of the 4-stroke cycle which was to provide the driving force for transportation for over a century. Nikolaus Otto died on 26th January 1891. The induction stroke is generally considered to be the first stroke of the Otto 4-Stroke Cycle. At this point in the cycle, the inlet valve is open and the exhaust valve is closed. As the piston travels down the cylinder, a new charge of fuel/air mixture is drawn through the inlet port into the cylinder. The adjacent figure shows the engine crankshaft rotating in a clockwise direction. Fuel is injected through a sequentially controlled port injector just behind the inlet valve. From a theoretical perspective, each of the strokes in the cycle complete at Top Dead Centre (TDC) or Bottom Dead Centre (BDC), but in practicality, in order to overcome mechanical valve delays and the inertia of the new fuel/air mixture, and to take advantage of the momentum of the exhaust gases, each of the strokes invariably begin and end outside the 0, 180, 360, 540 and 720 (0) degree crank positions (see ). Compression in a spark ignition engine is used to force the oxygen and hydrocarbon molecules of the fuel/air mixture into close proximity with each other. This not only raises the temperature significantly (the work of compression is converted into heat), but the action transforms the mixture from something that is extremely difficult to ignite under normal atmospheric conditions into something that will burn rapidly after being ignited with just a spark. Spark ignition is the point at which the spark is generated at the sparking plug and is an essential difference between the Otto and Diesel cycles. It may also be considered as the beginning of the power stroke. 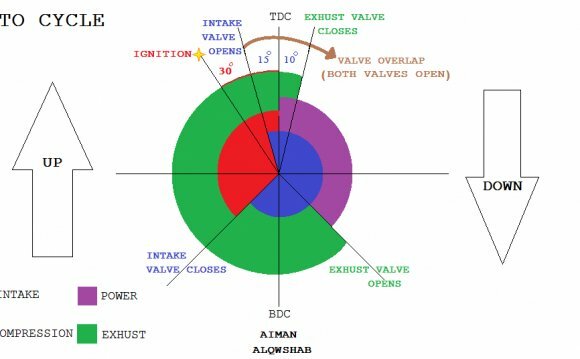 It is shown here to illustrate that due to flame propagation delays, spark ignition timing commonly takes place 10 degress before TDC during idle and will advance to some 30 or so degrees under normal running conditions. The power stroke begins as the fuel/air mixture is ignited by the spark. The rapidly burning mixture attempting to expand within the cylinder walls, generates a high pressure which forces the piston down the cylinder bore. The linear motion of the piston is converted into rotary motion through the crankshaft. The rotational energy is imparted as momentum to the flywheel which not only provides power for the end use, but also overcomes the work of compression and mechanical losses incurred in the cycle (valve opening and closing, alternator, fuel pump, water pump, etc.). Formula SAE is a student design competition organized by the Society of Automotive Engineers (SAE, also known as SAE International). The competition was started back in 1978 and was originally called SAE Mini Indy.